Frank Foti of Omnia Audio has been promoting a stereophonic FM encoding method described by William H. Gillman in 1997 and implemented a decade earlier by Robert C. Tarsio. Instead of using a double-sideband signal in the L−R subchannel, the technique uses a single lower sideband at twice normal amplitude. The objective is to reduce subchannel signal bandwidth, which is thought to lower distortion due to multipath propagation. SSB also is thought to better protect SCA and RDS by increasing the guard band, and to narrow the RF bandwidth, decreasing interference to HD Radio sidebands and adjacent-channel signals and reducing signal degradation due to incidental RF bandlimiting at the transmitter. Gillman claimed that the SSB technique was “100% compatible with existing receivers.” But stereo separation for receivers with a sloping composite response will degrade when receiving an SSB signal. The missing upper sideband no longer compensates for passband droop as it does for a DSB signal. This affects virtually all receivers with an analog IF. SSB is incompatible with any receiver that relies on the L−R quadrature channel. For example, several Sony receivers use it to estimate stereo S/N. They will see gobs of unexpected power in an SSB signal. The receivers will aggressively reduce stereo separation to shield the listener from what they think is a severely degraded signal. No postdetection filter that uses a vestigial sideband technique will function properly with an SSB signal, and it will render useless a quadrature multipath monitor. Finally, SSB has modulation peak-limiting issues Robert Orban discusses here. Despite its drawbacks, SSB might be worth considering if it could improve reception quality in difficult terrain by reducing multipath distortion. But it wasn't clear how much benefit, if any, the technique might provide. No one had suggested any numbers. I created a multipath simulation to see if it might shed any light on the issue. The simulation generates a monophonic, DSB stereo, or SSB stereo composite signal with multitone modulation. It frequency-modulates the composite onto a baseband carrier, sums one or more delayed and attenuated signal replicas, filters the sum to model the IF passband, detects the FM, demodulates the stereo channels, and calculates the audio spectrum for distortion analysis. The simulation sample rate is 1.024 MHz. Trigonometric recurrences generate an I/Q baseband FM signal. An IIR or FIR filter models the IF passband. An arctangent with implicit limiter and phase unwrapping detects FM by determining the phase difference between successive samples. A product detector demodulates the L−R signal with a 38 kHz sine wave phase-locked to the 19 kHz pilot. Summing and differencing the composite and L−R yields L and R. A 2048-point FFT provides a spectral resolution of 0.5 kHz. Restricting modulation frequencies to FFT bins prevents spectral leakage without using data windows. This is the detector output with no IF filter. A carrier 100% modulated with a 3 kHz monophonic tone sums with a replica delayed 30 µs and attenuated 0.5 to 4 dB. Y-axis calibration is instantaneous frequency deviation. Although the deviation of each signal is 75 kHz, their sum confounds an FM detector. Waveform spikes are characteristic of severe multipath interference. This compares the spectra of detected DSB and SSB stereo composite signals with no IF filter or multipath. Modulation is four single-channel tones whose levels differ. L+R is on the left, L−R is to the right, and the 19 kHz pilot is between. Except where noted, the simulation used left-channel stereo modulation with 9% pilot and no preemphasis. DSB modulation was 100%. SSB used the same tone levels and I made no attempt to equalize its peak composite amplitude to that of DSB. No combination of modulation and multipath in this study exceeded the detector's instantaneous frequency deviation limit. To quantify performance under multipath conditions, the simulation calculates the ratio of signal power to distortion power in the demodulated audio. It modulates with multiple tones to better elicit intermodulation products. This is the demodulated audio spectrum for tones at 0.5 and 1 kHz. Half-cosine interpolation monotonically smooths the curve between data points 0.5 kHz apart. The right channel is below −100 dB for both DSB and SSB. This is the spectrum after summing a signal replica delayed 10 µs and attenuated 10 dB. This models a path difference of 3 km from a reflecting surface with a large radio cross-section. The multipath causes distortion in both channels even though only one is modulated. To illustrate distortion due only to multipath, this example and those in the next section use no IF filter. Define S as the power sum at the tone frequencies. Define D as the power sum to 15 kHz excluding the tone frequencies and DC. S and D sum the power in both channels. 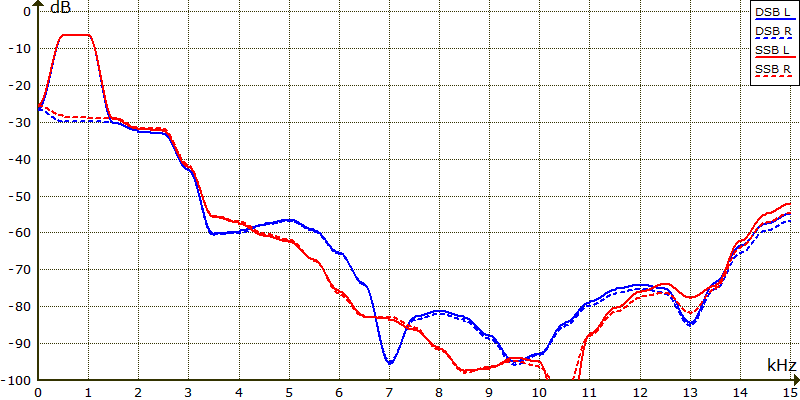 For the signal above, DSB S/D is 20.4 dB and SSB S/D is 19.5 dB. SSB S/D advantage: −0.9 dB. 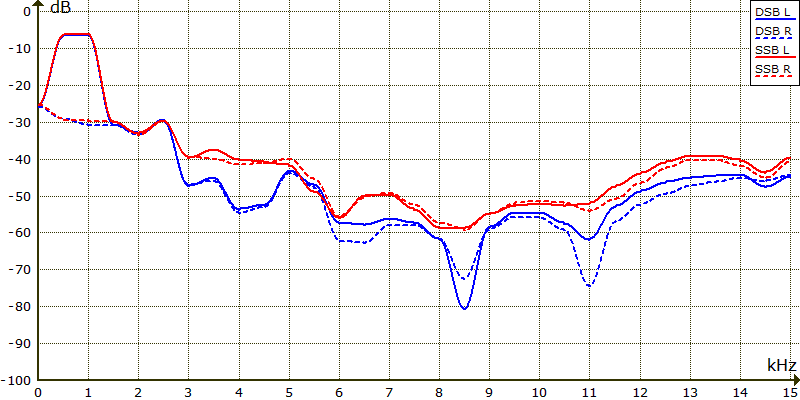 Here the signal replica at 10 µs is raised to −1 dB. SSB S/D advantage: −4.3 dB. Here the delay is increased to 24 µs at −1 dB. SSB S/D advantage: −0.3 dB. This shows tones at 7.0 and 7.5 kHz with a signal replica delayed 10 µs at −10 dB. SSB S/D advantage: −0.9 dB. Here are tones at 14.5 and 15.0 kHz with a signal replica delayed 10 µs at −10 dB. SSB S/D advantage: 0.0 dB. This simulation uses tones at 0.5 and 1.0 kHz and five signal replicas delayed 6, 10, 19, 23, and 38 µs at −8, −10, −12, −17, and −18 dB. SSB S/D advantage: −1.2 dB. I modeled an analog IF filter with a fourth-order IIR filter. Bandwidth and group delay are similar to those of a cascaded pair of 280 kHz ceramic filters, a common configuration in wideband analog IF strips. The 10.7 MHz curves are for two types of Murata 280 kHz filter. I modeled a digital IF filter with a 64-tap FIR filter with 16-bit coefficients. Bandwidth is 225 kHz and group delay is constant. A digital IF strip might use a similar filter, perhaps preceded by an analog roofing/antialias filter (not modeled). Most likely the sample rate of a digital IF strip would be lower than that of the simulation. This would narrow the transition band. The following tables summarize the SSB S/D advantage for modulation with tone pairs. Multipath delay ranged from 1 to 40 µs in 0.98 µs steps and attenuation from 1 to 40 dB in 3 dB steps. One tone is at the indicated frequency and the other is 0.5 kHz lower. Values are in dB. To increase modulation variety and complexity, I replaced the 15 tone pairs with 100 waveforms, ten of which appear above. Each waveform sums two to ten tones of equal amplitude. Tone frequencies are random multiples of 0.5 kHz to 15 kHz. 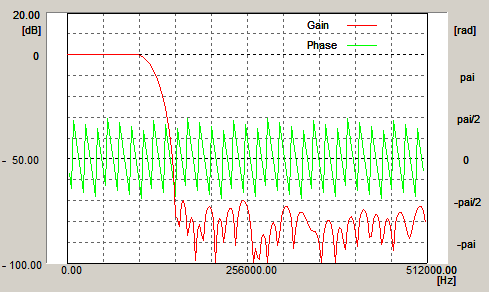 An optimizer adjusted tone phases to minimize peak amplitude and then normalized it for 100% DSB modulation. The following tables show nonzero SSB S/D advantage values in dB averaged over the waveforms at 574 combinations of multipath delay and attenuation. Replica delay in µs is down the left side. Replica level in dB is across the top. Color for SSB S/D averaged over the waveforms: 0 10 20 30 40 50 60+ dB. Use it to judge the significance of the SSB S/D advantage figures. 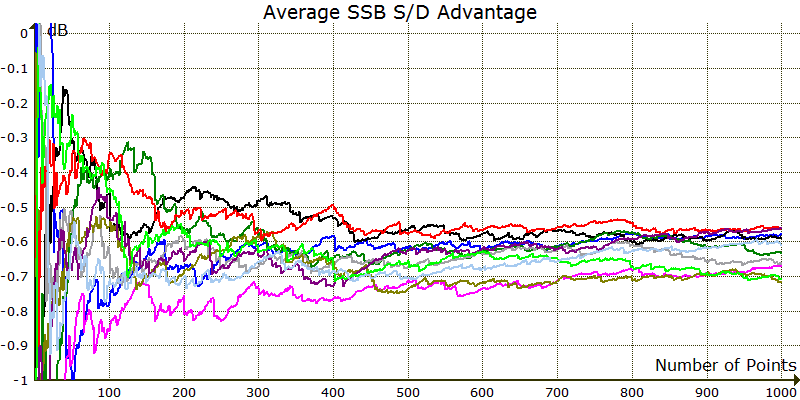 This graph shows the convergence of a stochastic simulation that estimates average SSB S/D advantage by another method. The simulation randomly selects a multipath delay over an extended 2–99 µs range and an attenuation in the 1–40 dB range. There it calculates the SSB S/D advantage using a modulation waveform with two to ten tones randomly selected from a set of 1600. It updates the average value with the result and then repeats at another point. The graph shows how ten trials converged for the analog IF filter. Over the same multipath delay range, the deterministic average obtained with the 15 tone pairs was −0.55 dB. With the 100 waveforms, it was −0.69 dB. Something other than averaging over all waveforms may better characterize distortion audibility for complex modulation. Occasional distortion events may distract and annoy a listener even though average distortion is low. For example, the first sign of multipath for voice modulation often is sibilant spitting. But the waveforms responsible may be infrequent, their contribution lost in an average. At each point in the following tables, the simulation summed the nine worst S/D values each for DSB and SSB among 3000 random modulation waveforms. SSB S/D advantage is the ratio of the sums. In effect, two 0.3% averages replace one 100% average. Tests at −1 and −4 dB showed that among waveforms with two to ten tones, those with two to five caused 95% of the worst S/D values. I restricted the number of tones to this range to maximize waveform effectiveness. Color for SSB S/D averaged over the nine worst values: 0 10 20 30 40 50 60+ dB. Use it to judge the significance of the SSB S/D advantage figures. As a model check, I calculated the monophonic S/D advantage over DSB stereo using the 15 tone pairs. The value averaged over all pairs, attenuations, and delays in the 2–99 µs range was 13.1 dB for the analog IF filter and 14.6 dB for the digital. The value averaged over all delays and attenuations for the tone pair with the worst S/D at each point was 15.8 dB for analog and 17.1 dB for digital. This graph shows distortion for a 1 kHz tone for the analog IF filter with 100% modulation, 75 µs deemphasis, and no multipath. 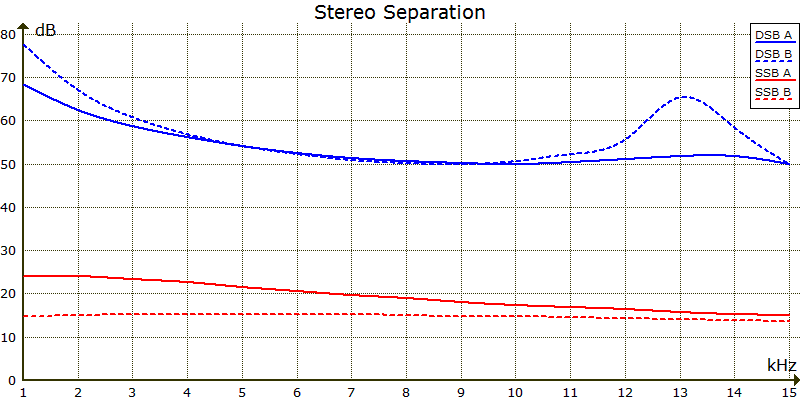 Total harmonic distortion is 0.04% for mono, 0.05% for DSB, and 0.23% for SSB. The stereo figures include distortion in both channels. No even-order distortion products exist because the filter passband is perfectly symmetrical. Real analog filters with some asymmetry generate at least the second harmonic. This is distortion for the digital IF filter. THD is 0.004% for mono, 0.20% for DSB, and 0.13% for SSB. These transmit spectra are for 100% modulation with a single tone at the indicated frequency. 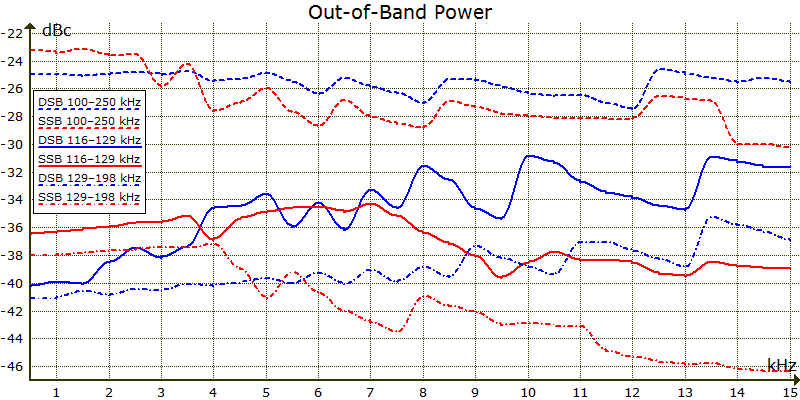 0 dB is unmodulated carrier power. 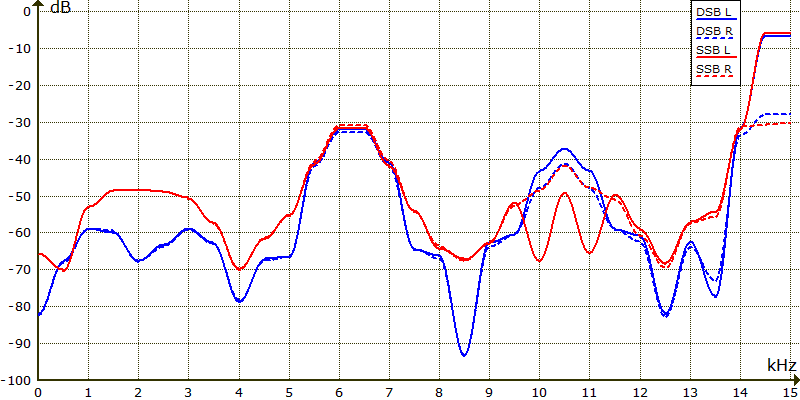 These curves are for 100% modulation with a single tone whose frequency changes in 0.5 kHz steps along the X axis. Plotted is total power in the indicated two-sided region from channel center relative to unmodulated carrier power. HD Radio sidebands occupy 129–198 kHz in MP1 mode. MP3 mode adds 116–129 kHz. This is the power splashed into 67±8 kHz by a signal replica attenuated 20 dB at the indicated delay. Modulation is a single tone whose frequency changes in 0.5 kHz steps along the X axis. 0 dB is SCA carrier power. I set 105% modulation with 10% SCA, 9% pilot, and 5% RDS injection and then disabled the SCA and RDS signals. To model interference due to multipath distortion only, I did not use an IF filter. This is the power in 92±8 kHz. This is the power in 57±2 kHz weighted by the RDS cosine receive filter. 0 dB is RDS carrier power. I generated this sound sample to verify that the simulation was on the right track. It is a left-channel DSB stereo signal without and with a signal replica delayed 41 µs and attenuated 6 dB. Unlike the tone simulation, this one uses preemphasis/deemphasis, a subcarrier modulator, and antialias filters. The model uses 100% peak modulation, the analog IF filter, and an audio sample rate of 32 kHz. This spectogram shows how multipath corrupts the audio spectrum. The right channel is almost pure distortion. Try listening with your stereo balance control all the way to the right. This two-channel piano has replicas at −10 dB delayed 78 and 98 µs. Hills 12 and 15 km away might produce this multipath. This guitar has −10-dB replicas at 44 and 63 µs. Multipath still dirties the sound with the replicas at −20 dB. Use this program to explore DSB multipath with your own sound samples. The simulation models static, free-space propagation to a stationary receiver. SSB modulation level is not constrained to 100%. The SSB model has no upper sideband. Practical SSB implementations may use a vestigial sideband technique that retains some USB power to a few hundred Hz. Real stereo decoders with various phase-locked loop bandwidths and oscillator waveforms may behave differently than the simulation decoder for strong multipath. The detector's instantaneous frequency deviation limit is 768 kHz. The limit for a real detector may differ, as may its behavior near the limit and beyond. Below its limit the arctangent detector is essentially distortionless. A real detector may generate enough distortion to obscure small but measurable amounts of multipath distortion. The arctangent detector provides perfect limiting. Low-gain receivers may not limit on weak signals, while strong signals may cause some receivers to limit in amplifier stages that precede one or more IF filters. The simulation assumes perfect transmitter and receiver performance in stages not modeled. Imperfections in real equipment may add distortion products that mask low-level multipath distortion. The simulation does not model channel noise, co-channel or adjacent-channel interference, RF intermodulation, or HD Radio self-noise. Such impairments may cover up weak multipath distortion in real receivers. The simulation does not model receivers like the Sony XDR-F1HD that dynamically vary IF bandwidth. The simulation does not model receivers that mitigate multipath distortion by channel blending, IF blanking, or adaptive IF equalization. The simulation distortion measure does not account for perceptual effects that may influence listener preference. Because ceramic filter characteristics can vary greatly from unit to unit, and because receivers employ a variety of specialized types, it's best to treat models using these filters as examples. Results may differ for particular receivers. This applies to the next two sections as well. The stereo composite response of analog FM receivers isn't flat. It slopes due to the IF filter, detector, and postdetection filter. But since the stereo demodulator inverts the LSB spectrum, the falling USB response largely compensates the rising LSB. Composite equalization isn't necessary for high stereo separation because USB/LSB response compensation is so effective. But when the USB is missing, compensation no longer occurs. 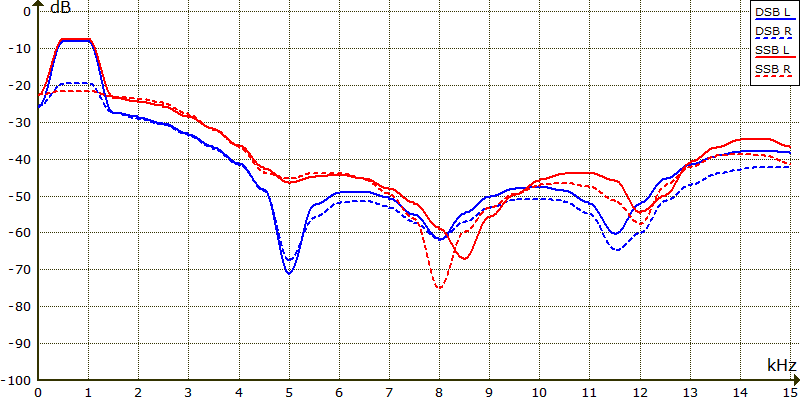 I calculated these stereo separation figures in dB from the composite response of a Sony ST-S555ES tuner. 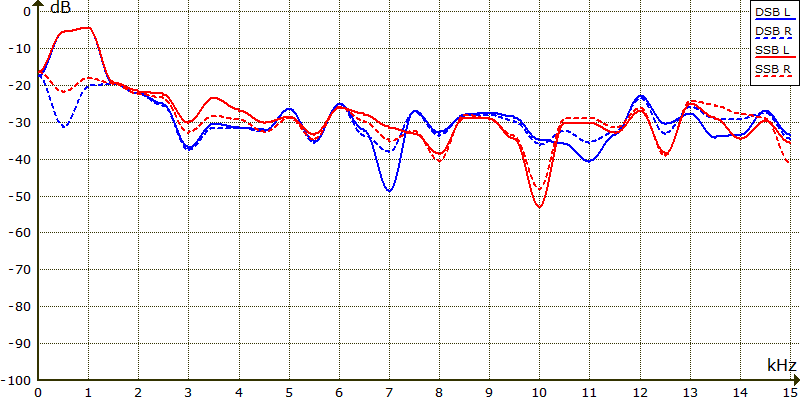 I measured the composite amplitude and phase at 1, 15, 23, 37, 39, and 53 kHz. 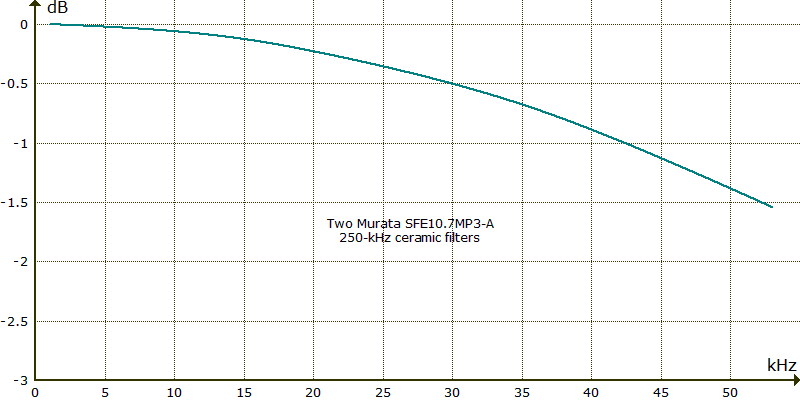 The wide IF filter is a pair of Murata SFE10.7MP3-A 250 kHz ceramics. I measured the response prior to the tuner's elaborate postdetection filter to obtain values more typical. The modified narrow IF uses two SFE10.7MHY 110 kHz ceramics cascaded with the 250s. This response includes the postdetection filter. For each IF bandwidth I calculated the L+R matrix coefficient that maximizes separation at 1 kHz. This is equivalent to using individual stereo separation trimpots for each bandwidth. SSB uses the DSB coefficients since it's stuck with the DSB-aligned trimpot settings. I used this program to calculate stereo separation. The following manual calculations verify the wide separation figures by ignoring composite phase, which for the wide filter varies quite linearly with frequency. Data: composite amplitude is 689, 679, 665, 631, 625, and 577 mV at 1, 15, 23, 37, 39, and 53 kHz. Trimpot 1 kHz DSB L−R is the average of the 37- and 39-kHz values = (631+625)/2 = 628. To maximize 1 kHz separation, multiply L+R by C = 628/689 = 0.9115. C represents the stereo separation trimpot. 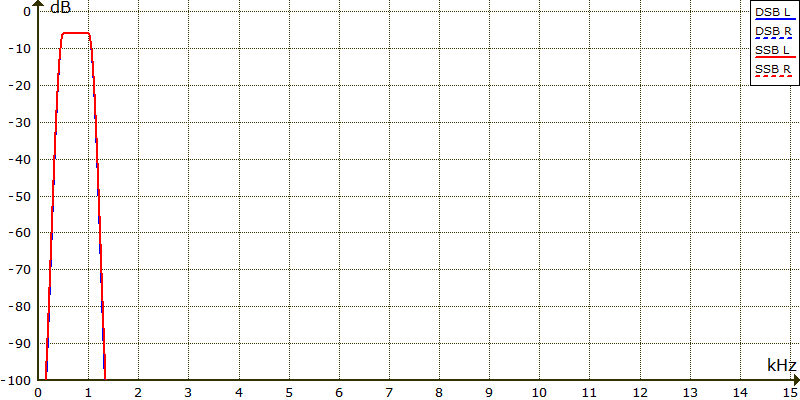 DSB 1 kHz: R = C(L+R) − (L−R) = 0.9115(689) − 628 = 628.02 − 628 = 0.02. L = C(L+R) + (L−R) = 628.02 + 628 = 1256.02. 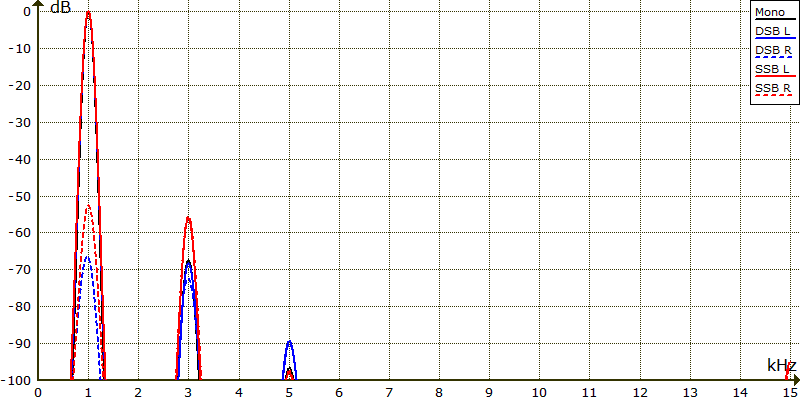 20LOG(|L|/|R|) = 20LOG(1256.02/0.02) = 96.0 dB. 15 kHz: R = 0.9115(679) − (665+577)/2 = 618.91 − 621 = −2.09. L = 618.91 + 621 = 1239.91. 20LOG(1239.91/2.09) = 55.5 dB. SSB 1 kHz: R = 0.9115(689) − 631 = 628.02 − 631 = −2.98. L = 628.02 + 631 = 1259.02. 20LOG(1259.02/2.98) = 52.5 dB. 15 kHz: R = 0.9115(679) − 665 = 618.91 − 665 = −46.09. L = 618.91 + 665 = 1283.91. 20LOG(1283.91/46.09) = 28.9 dB. It is possible to greatly simplify a receiver postdetection filter by taking advantage of redundancy in the DSB stereo signal. The filter can roll off well below 53 kHz and still provide high stereo separation. Its response over the L−R subchannel is such that the sum of the demodulated LSB and vestigial USB is nearly constant. 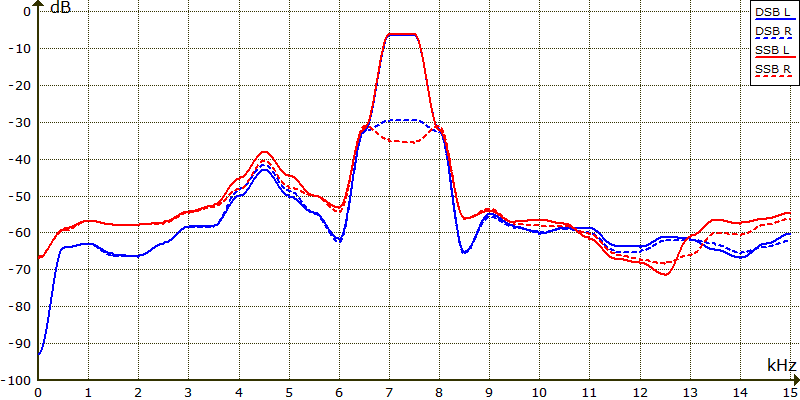 The blue curves show stereo separation for two VSB postdetection filters. Both maximize rejection of detected HD Radio sidebands at 190 kHz while providing 50 dB minimum stereo separation and 0.5 dB maximum response error. Filter A assumes a flat composite response, while B uses the response for two Murata SFE10.7MP3-A ceramics and optimizes 38 kHz VCO phase. The red curves show separation for an SSB signal, which has no USB to compensate the LSB roll-off.